These classic pure butter Gluten Free shortbread rounds offer a crumbly "melt in your mouth" texture - delicious. 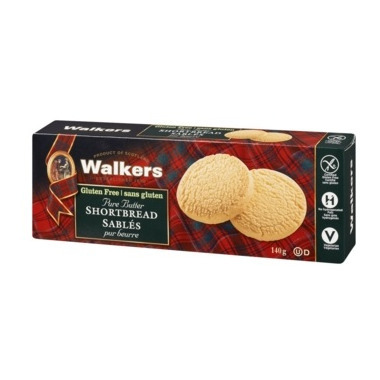 Walkers have been baking shortbread in the Scottish Highlands since 1898. They still use only the finest pure ingredients with no artificial colours, flavourings or preservatives. The best! I could tell no difference, if I did not know Iâ€™d think Iâ€™m eating a regular shortbread made with wheat flour. So good! Love these. Taste just like shortbread. These are about the best gluten free biscuits I've tried and I've tried many! Yum yum, they almost taste like the non gluten free ones! taste like the cookies I've eaten all my life. couldn't tell they were gluten free, which is a good thing. I'm gluten intolerant and cannot remember the last time I had short bread. I will admit that I gobbled these up quickly. Walkers did a really good job for gluten free shortbread! Great tasting shortbread - no too sweet like some GF cookies. Lovely crumbly texture, very similar to the non GF one! Like the non GF one! Love these. Wish I could order more. They taste way better than the Pamela one's. Fantastic tasting shortbread! You'd never know it was gluten free! Well.ca needs to bring on the other flavours too! Quite simply the best GF shortbread I have ever eaten - only four simple ingredients too!